This essay illustrates the latest research concerning the main operational structures and developments of Ionian Islands shipping during the nineteenth century, particularly during the period of British sovereignty (1815-1864). Though the Ionian Islands are in the middle of the Mediterranean basin, little was known of their maritime past or their participation in the expansion of the Mediterranean and Atlantic economies in the nineteenth century. Thus much of the global context of Ionian shipping was missing, and it was difficult to study the development and operations of the islands’ merchant fleet. This difficulty was resolved to a great extent with the creation of Odysseus, the Ionian Maritime History Database, which includes 21,000departures and arrivals in the islands in 1809-1864. L’objectif de cet essai est d’illustrer les résultats récents de recherches concernant les principales structures d’exploitation portuaire et le développement des îles Ioniennes au cours du xixesiècle, et plus précisément durant la période de souveraineté britannique sur les îles (1815-1864). En dépit du fait que les îles Ioniennes se trouvent au milieu du bassin méditerranéen, nous ne connaissions pas beaucoup leur passé maritime et leur participation à l’expansion de la Méditerranée et de l’économie atlantique au xixesiècle. Par conséquent, il manquait des pièces majeures dans la vision globale de la navigation, et il était difficile d’étudier les conditions du développement, de la croissance et de l’exploitation de la flotte marchande des îles Ioniennes. Ces lacunes ont pu être comblées en grande partie par la création d’Ulysse – Base de données de l’histoire maritime des îles Ioniennes, qui comprend un total de 21 000départs et arrivées des îles Ioniennes au cours de la période 1809-1864. 3What we did actually know about 19th century Ionian shipping until a few years ago, was that shipping in the Ionian Islands experienced a significant development during the 19th century, especially during the period of British sovereignty; that the Ionian merchant fleet was regularly present in the major ports of the eastern and western part of the Mediterranean Sea; that the Ionians played an important role in transporting grain cargoes from the Black Sea to the main ports of the western Mediterranean, and that Ionian shipping offered to the Greek-owned commercial shipping an impulse to further development, via the separation of commercial and shipping activities, which produced a shift from the profession of tradesman-shipowner to specialized shipowner. 4However, a great part of the whole picture of Ionian shipping was still missing, and as a result we were not able to study and understand thoroughly the terms of development, growth and operations of the merchant fleet of the Ionian Islands. To be more specific, we did not have a clear picture of the number, types and capacity of Ionian vessels; we did not know about the variety of cargoes Ionian shipowners transported or the cargoes they were interested in, the commercial routes they used, the ports they preferred to trade with. Furthermore, we knew nothing about the shipowning families of the Ionian Islands, the origin of the Ionian shipmasters and crews. 5Apart from these quantitative aspects or features of Ionian shipping, we did not know much of its qualitative aspects, neither. For instance, we ignored whether and how the regime of British sovereignty influenced the development of Ionian shipping, which was the real impact of Ionian shipping on the economy and, perhaps more importantly, we did not have a precise idea of the main structures of the insular society and of the maritime status of the Ionian Islands. 6Consequently, we had to deal with two critical issues during our research: the first issue, the quantitative one, was the lack of large statistical series that could provide all the necessary information concerning the various developmental aspects and operational features of the Ionian merchant fleet. The second issue was qualitative, or more precisely institutional, and had to do with the institutional role that Britain, the protecting power of the Ionian Islands, played in the development and growth of Ionian shipping. 7Facing these two critical issues for the study and understanding of Ionian shipping during the 19th century, we decided to search for the adequate archival material in the State General Archives of Corfu and Cephalonia, as well as in the British National Archives. The outcome of this research, which constituted a part of a doctoral dissertation, was the creation of the Odysseus – Ionian Maritime History Database. Part of the Odysseus – Database will be published online (http://www.marehist.gr).4 The Odysseus – Database includes more than 21,000 departures and arrivals from and to the Ionian Islands during the years 1809-1864. Most of the data come from the governmental newspaper of the British protected Ionian State, the Gazzetta Uffiziale Degli Stati Uniti Delle Isole Jonie. Before proceeding to the presentation of the Odysseus – Database and its main results, which is the aim of this paper, it is necessary to present first a brief historical background of the Ionian Islands, emphasizing especially the British regime imposed over them by the Treaty of Paris in 1815. 8 . The Saturday Magazine, n° 515, 11 July 1840. 15With this brand-new database at disposal we had the appropriate electronic tool in order to re-read the maritime history of the Ionian Islands during the period of British sovereignty.15 Within the context of this essay, particular emphasis shall be given to a brief presentation of the main developmental and operational structures of the Ionian shipping arising from the use of the Odysseus – Database. The presentation of the Odysseus – Database is divided into four sections: in the first part (a) we present the main characteristics of the Ionian merchant fleet (number of vessels, tonnage and type of vessels); in the second part (b) we analyze the development of the Ionian maritime network in the Mediterranean basin; in the third part (c) the emphasis is given to the grain-cargo specialization of the Ionian merchant shipping, whereas the last part (d) evaluates the gradual emergence of sea as the main source of wealth for the Ionians, replacing land, which was hitherto the main source of wealth. 16Let us first proceed to the presentation of the size (capacity) of the Ionian merchant fleet. 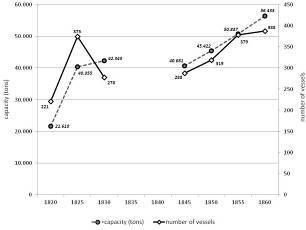 Figure 4 depicts the capacity of the Ionian fleet, expressed in metric tons, at 5-year intervals in the period 1820-1860. As we have already mentioned, data for the years 1835 and 1840 are missing because of a gap of data for the years 1831-1844 in the Gazzetta. It is easy to see that the capacity of the Ionian fleet experienced a steady and considerable growth throughout the period of British sovereignty. From a capacity of 21,600 tons in 1820, at the beginning of the period of British sovereignty, the Ionian fleet grew to a capacity of almost 56,500 tons in 1860, four years before the end of the British regime: the growth represent more than 160% in forty years. Source: Odysseus-Ionian Maritime History Database. Intra-Ionian voyages are excluded; No data is available for the years 1835 and 1840. 18Which were the main areas of the maritime and commercial activity of the vessels sailing under the Ionian flag, during the period between 1850 and 1860? This decade was chosen because it represents the peak of the specialization of the Ionian merchant shipping in specific trade routes and products before the end of the British regime (1864). 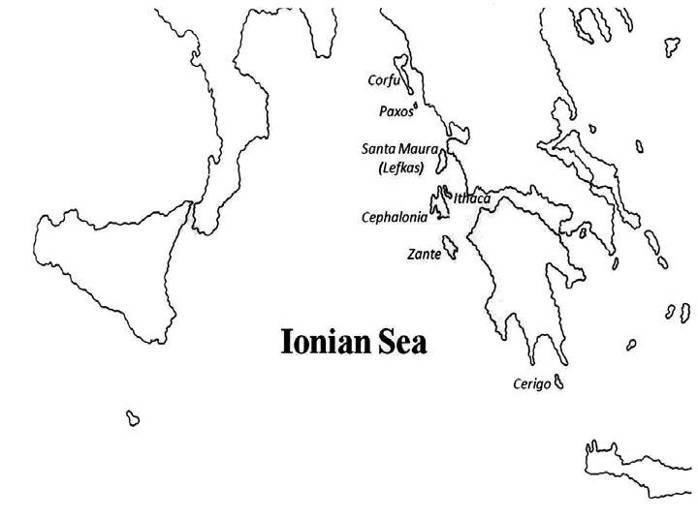 This period provides the clearest picture of the radius of commercial activity of the Ionian merchant fleet, and allow us to identify the main trading ports used by Ionians and, consequently, those of their Islands during this period, Figure 5, based on a total of 2,135 voyages of Ionian vessels in the Odysseus – Database, shows that the ports with which Ionian vessels traded, are located in the central and eastern part of the Mediterranean, mainly in the areas of the Black Sea, the Adriatic Sea and the Aegean Sea. The map shows the most important trading ports for Ionian merchant vessels, those for which at least 10 ship-movements (arrival or departure) among Ionian merchant ships were recorded. 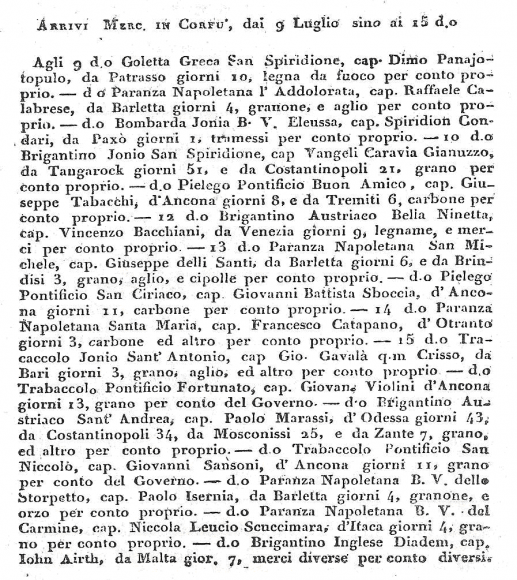 Three Mediterranean ports stand clearly out: the port of Constantinople, with a total of 561 Ionian ship-movements (departures & arrivals for the years 1850, 1855 & 1860), the port of Trieste with a total of 210 ship-movements, and the port of Valletta (Malta) with a total of 176 Ionian ship-movements. The Odysseus – Database shows also that Ionian vessels hardly sailed outside the Mediterranean. During the period 1850-1860, we recorded less than ten voyages of Ionian vessels to and from non-Mediterranean ports. We believe that this is the result of the specialization of the Ionian merchant fleet in trading grain cargoes almost exclusively within the Mediterranean basin. 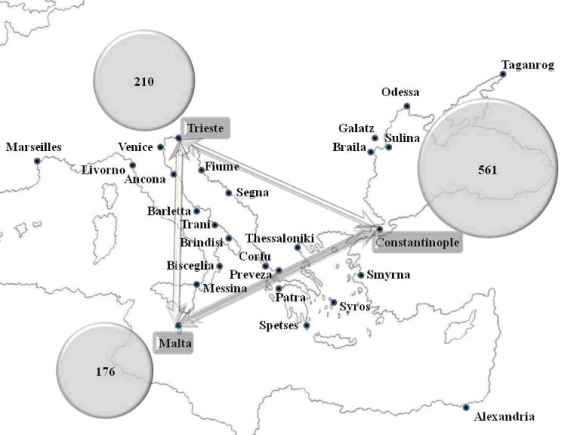 Notes: Numbers in circles indicate the total amount of Ionian ship-movements to and from the ports of Constantinople, Trieste and Malta. All other ports had at least 10 ship-movements. 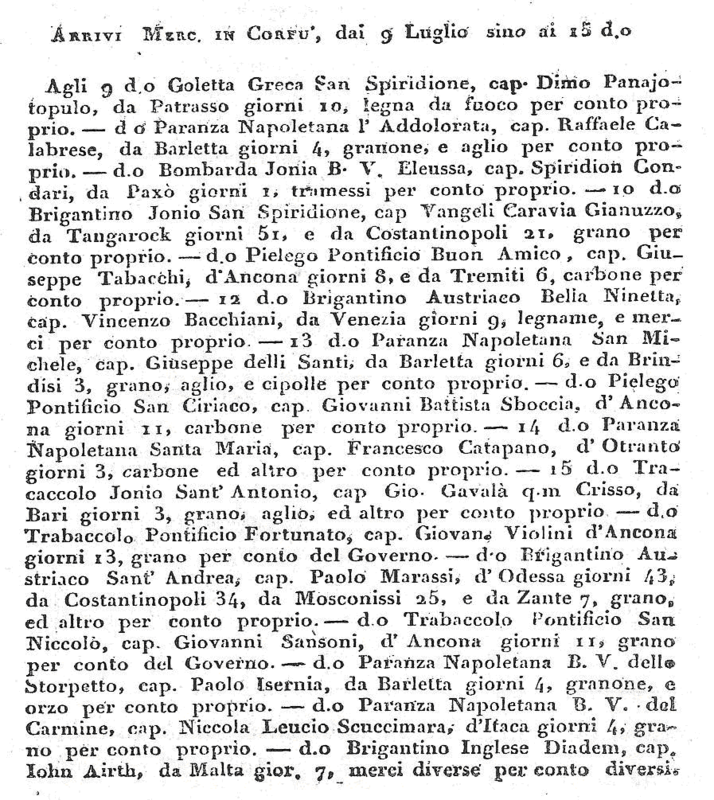 19In other words, we observe the creation, during the mid-19th century, of a commercial triangle, the angles of which coincide with the ports of Constantinople (representing more than 26 per cent of the total Ionian ship-movements for the years 1850, 1855 and 1860), Trieste (representing almost 10% of the total), and Malta (representing more than 8%). The importance of Constantinople proves the strong Ionian maritime and commercial presence in the Black Sea wheat-export ports, mainly in the ports of Odessa, in the Azov Sea (Taganrog, Rostov on Don, Kerch, Berdiansk, Mariupol, Yeysk), and in the Danube outlet (Sulina, Galatz, Braila). The Ionians were engaged, almost exclusively, in a sea-trade within the above-mentioned commercial triangle. This reality should be viewed as the result of the gradual specialization of the Ionian merchant fleet in transporting grain cargoes from the granaries of the Black Sea towards some of the main import and transit ports of central Mediterranean, such as the transit port of Malta or the import port of Trieste, although this picture is partially affected by the fact that the Odysseus – Database captures only the itineraries of those ships which called in the Ionian Islands. 20Having presented the most significant trading ports for the Ionian merchant shipping, let us now focus on the products cargoes that Ionian vessels supplied to the Mediterranean during the years 1850, 1855 and 1860. Due to a lack of information in the Gazzetta on the value and volume of the traded merchandise, we chose to present in the following chart the percentage of the cargoes traded by Ionian sea-going vessels from, to and via the Ionian Islands ports, based on the number of cargoes being traded. Although we do know that the use of the number of cargoes may be somewhat problematic, there is no alternative at present to provide a rough picture of the cargoes supplied by the Ionian fleet in the Mediterranean ports at this time. Source: see figure 4. Total number of transported cargoes for the years 1850, 1855 and 1860: 1 356. 21The Ionian merchant fleet clearly specialized to a great extent in the transport of grain cargoes, which came from the Black Sea and the Danube: grain accounted for 41% of total transported cargoes. 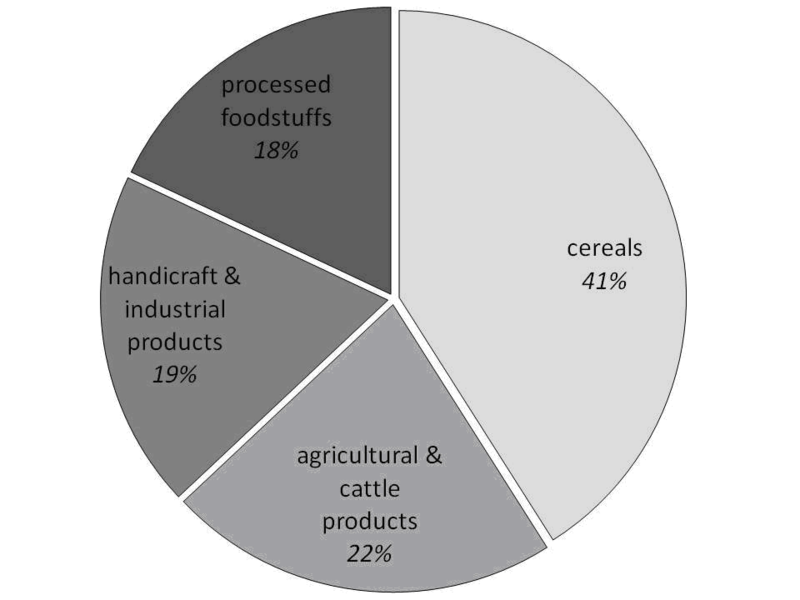 Cattle and other agricultural products, including fruits, almonds, tartar, saffron, sumac, hazel-nuts, raw silk, frankincense, liquorices, legume, animals, wood, timber and olives, amounted to 22% of the total number of cargoes. Handicraft and industrial products, namely verdigris, cotton yarn, wrought silk, soap, soda, metal ores, leathers and gum, amounted to 19% of the total, whereas processed foodstuffs consisting mainly of salt, currants, olive oil, dried figs and plums, salted lemons, treacle, vinegar, meat and dairy products (mainly cheese), amounted together to 39% of the total number of cargoes. 22Besides providing information on the capacity, number and type of sailing vessels, commercial routes, and transported merchandises, the Odysseus – Database has functioned as a scalpel, with which we had the opportunity to get deeply into the various layers of the body of the Ionian society. 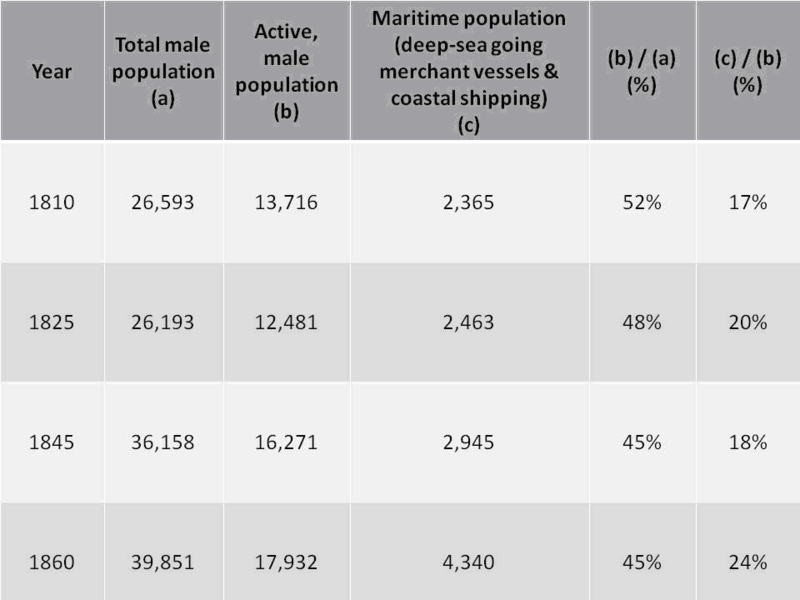 Thanks to the Odysseus – Database we have found out that almost one fourth of the population of the tiny state of the Ionian Islands was working in or related to the Ionian maritime industry. The sea was, during the eighteenth and nineteenth centuries, and still is, a difficult, strange, and changeable working environment, with demanding and dangerous working conditions both on board and on shore. In the midst of the 19th century, the Ionians began to face sea not only as an attractive and relatively easy-to-obtain source of wealth, but also as an opportunity to build solid and successful careers in the promising field of maritime industry. The main maritime centre of the Ionian Islands, the island of Cephalonia, provides a significant case study.18 According to our estimations based on the type of vessel and on the average number of the crew for each different type of vessel, we have reached very interesting conclusions. The maritime population of Cephalonia has experienced a steady growth. Whereas in 1810 –the first year of the British occupation of the island of Cephalonia– the maritime population of Cephalonia numbered no more than 2,400 seafarers, representing 17% of the active male population of the island at that time, fifty years later, in 1860, the maritime population of Cephalonia numbered almost 4,500 seafarers, accounting for more than 24% of the active male population of the island (see figure 7 above). However, what is even more interesting, according to our opinion, is the fact that many powerful members of the old Venetian nobility, a nobility based on the possession of land, and many members of the new political elite of the British protected Ionian State, started to orientate their business interests towards the sea, ships and sea-trade, in other words towards the promising fields of maritime businesses. At the beginning of the 19th century Ionian society started experiencing the gradual emergence of the sea as the main source of wealth replacing land, the hitherto main source. The case of Pavlos Focas Alexandratos, who was one of the most important politicians, landowners, ship-owners and merchants of the Ionian State during the decades 1840 and 1850, clearly illustrates this shift. Pavlos Focas Alexandratos was born in 1793 in the capital of Cephalonia, Argostoli, and died in 1864. He was a Cephalonian of distinguished and noble origin, and according to unpublished notarial deeds, he was a well known ship-owner, financier of Cephalonian captains, and guarantor of many Cephalonian ship-owners for building their ships, since the decade 1820.19 Yet, during the first decades of the British regime over the Ionian Islands, his main source of wealth was land, not sea. However, in 1842, and after having served for many years as member of the parliament of the Ionian State, he decided to abandon the “safety” of land and he entered dynamically the field of merchant shipping by establishing the first Ionian and one of the first Greek maritime insurances company, named Kefallinia Insurance Company, with its head-office located in Argostoli. The commercial orientation of the Ionian merchant vessels towards the Black Sea and the Danube River, and the consequential increasing demand of Cephalonian ship-owners for underwriting their vessels and cargoes, led to the rapid expansion of the activities of Kefallinia Insurance Company. Its activities encompassed not only the Ionian Islands and the main ports of the Aegean Sea, but also the nodal ports of the Black Sea and especially the ports of the Danube River. Kefallinia’s agents were appointed in Ithaca, Corfu, Patras, Thessalonica, Mytilene, Dardanelle, Constantinople, the Azov Sea, Odessa, Galatz and Sulina, and soon the company started cooperating with foreign insurance companies. Alexandratos’ company entered also into trading bulk cargoes of grain from Danube –especially after the Crimean War (1853-1856)– to the Ionian Islands but also to London, where he established, probably at the beginning of the 1850s, a joint-stock trading company, along with Panas from Cephalonia and Kremidis from Corfu, according to unpublished notarial deeds found in the Archive of the Prefecture of Cephalonia. Besides Danubian grain, the house of Alexandratos traded also Cephalonian currants to England, as well as to the Black Sea. In addition, he chartered his fleet of brigs, taking advantage of the high freight rates, especially during the Crimean War. Thus, the Kefallinia Insurance Company, and in fact the house of Pavlos Focas Alexandratos, diversified its business, and invested in maritime trade, shipping and even in the food industry. The hitherto unknown case of Pavlos Focas Alexandratos is one of the most important and indicative examples of how the promising field of maritime industry offered Ionians an opportunity to build solid and successful careers. In other words, the case of this noble landowner clearly shows the gradual emergence of sea as the main source of wealth for the Ionians instead of land. 23In the introduction to this essay, we raised the question of the institutional role that Britain, as the protecting power of the Ionian Islands, played in the development and growth of the Ionian shipping. In providing valuable information concerning the Ionian maritime past, the Odysseus – Database raises the question of understanding why the Ionians developed such a worth noticing maritime activity, whereas other Mediterranean islanders, like the Maltese for example, did not. 21 . See Panayiotis S. Kapetanakis, “The Ionian State…”, art. cit., p. 163-184. 26On the other hand, Great Britain sought to use the key geographical position of the Ionian Islands and the trade networks they belonged to since the time of the Venetian rule, in an endeavor to bolster British trade in the wider region of the central Mediterranean, to obtain and keep hold on new markets for its industrial products, and to find new sources of food supplies for its increasing urban and industrial population. The decision by Britain to give the Ionian Islands’ merchant navy the option to engage in a safe and independent business activity, without the restrictions it normally imposed on its colonies, should be understood with that consideration in mind. 1 . A first version of this paper, under the title “Merchant fleet of the Ionian Islands under the British rule (1815-1864)” was presented at the workshop “Réunion du GIS d’Histoire Maritime.” The workshop was organized by the University of Nice Sophia Antipolis / Centre de la Méditerranée Moderne et Contemporaine and was held in Nice (France), on 7-8 April 2011. 2 . For a brief review of Greek maritime history and its new directions and challenges, see Gelina Harlaftis and Katerina Papakonstantinou (dir. ), The Rise of the Shipping of the Greeks in the Mediterranean Trade in the 18th century, Athens, (forthcoming); Gelina Harlaftis and Radu G. Păun (dir. ), Greeks in 19th Century Romania (Proceedings of the International Conference, Bucharest, 2009, October 2-4), Athens, Alpha Bank Historical Archives, (forthcoming); Maria Christina Chatziioannou, “When the History of Merchant Houses Met Business History: A Comparative Approach”, Entreprises et Histoire, n° 63, 2011, p. 53-65; Gelina Harlaftis, “The ‘Eastern Invasion’. Greeks in the Mediterranean trade and shipping in the eighteenth and early nineteenth centuries”, in Maria Fusaro, Colin Heywood, and Mohamed-Salah Omri (dir. ), Trade and Cultural Exchange in the Early Modern Mediterranean: Braudel’s Maritime Legacy, London, Tauris Academic Studies, 2010, p. 223-252; Gelina Harlaftis, Nikos Karapidakis, Kostas Sbonias and Vaios Vaipoulos, The New Ways of History: Developments in Historiography, London, I B Tauris & Co Ltd, 2010; Evrydiki Sifneos, “Merchant Enterprises and Strategies in the Sea of Azov Ports”, International Journal of Maritime History, n° 1, June 2010, p. 259-268; Maria Christina Chatziioannou, “Networking and Spatial Allocation around the Mediterranean, Seventeenth-Nineteenth Centuries, Preface”, The Historical Review / La Revue Historique, n° 7, 2010, p. 9-13; Evrydiki Sifneos, Greek merchants in the Azov Sea. The power and the limits of a family enterprise, Athens, INR/NHRF, 2009; Gelina Harlaftis, “From Diaspora Traders to Shipping Tycoons: The Vagliano Bros”, Business History Review, n° 2, Summer 2007, p. 237-268; Gelina Harlaftis and Maria Christina Chatziioannou (dir. ), Following the Nereids. Sea routes and maritime business, 16th - 20th centuries, Athens, Kerkyra Publications, 2006; Gelina Harlaftis and Carmel Vassalo, “New Directions in Mediterranean Maritime History”, Research in Maritime History, n° 28, 2004. 3 . Fernand Braudel, La Mediterranée et le monde meditérranéen à l’époque de Philippe II, , Paris, Armand Colin, 9e édition 1990, p. 149-165; Predrag Matvejevitch, Mesogiaki Synopsis, Athens, Patakis Editions, 1998 (in Greek); Ellen Churchill Semple, The Geography of the Mediterranean Region: Its Relation to Ancient History, New York, Henry Holt and Company, 1931. 4 . My three-year Ph.D. study was part of the research project entitled Greek Maritime Centres: Identification and Administration of Maritime Heritage of the Ionian and Aegean Seas, under the Program PENED 2003. The research project was financed by the European Union and the Greek Ministry of Development, and was completed under the supervision of Professor Gelina Harlaftis (Ionian University, Department of History). See: Panayiotis S. Kapetanakis, “The deep-sea going merchant fleet of the Seven Islands during the time of British conquest and protection and the Cephalonian prominence (1809/15-1864). Fleet and ports, cargoes and sea-routes, maritime centres and seamen, entrepreneurship and networks, society and shipowning elites”, Ph.D. thesis, Department of History, Ionian University – Corfu, Typescript, 2010 (in Greek), (http://phdtheses.ekt.gr/ead d/handle/10442/18428). 5 . Thomas W. Gallant, Experiencing Dominion: Culture, Identity, and Power in the British Mediterranean, Notre Dame - Indiana, University of Notre Dame Press, 2002, Chapter 1. 6 . Eleni E. Koukkou, Istoria ton Eptanison. Apo to 1797 mexri tin Agglokratia. Protes Diplomatikes Energies tou Ioannou Kapodistria, Athens, Papadimas Editions, 2001, p. 197-207 (in Greek). 7 . Philip L. Cottrell, The Ionian Bank. An Imperial Institution, 1839-1864, Athens, Alpha Bank, Historical Archives, 2007, p. 118-119; Charles-James Napier, The Colonies: Treating of their Value generally – In particular of the Ionian Islands, London, Thomas and William Boone, 1833, p. 1-17. 9 . On the historical background of the Ionian Islands, from the fall of Venice up to the union with the Greek State, see Nikos Karapidakis, “Ta Eptanisa. Europaiki Antagonismi meta tin ptosi tis Venetias”, in Vassilis Panayiotopoulos (ed. ), Istoria tou Neou Ellinismou: 1770-2000, vol. I, Athens, Ellinika Grammata Editions, 2003, p. 149-184 (in Greek); Nikos G. Moschonas, “Navigation and Trade in the Ionian and Lower Adriatic Seas in the 18th century”, in Apostolos Vacalopoulos, Constantinos D. Svolopoulos and Bela K. Kiraly (dir. ), Southeast European Maritime Commerce and Naval Policies: From the Mid-Eighteenth Century to 1914, New Jersey, Atlantic Research and Publications, 1988, p. 189-196. 10 . 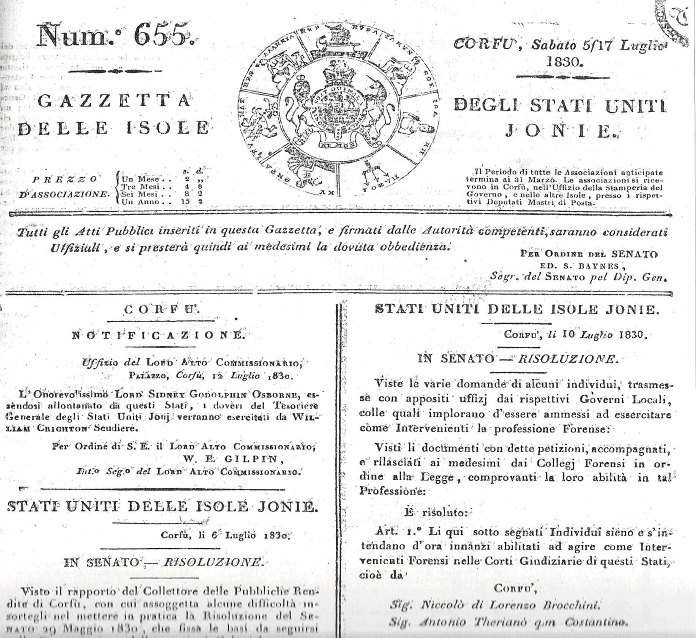 A digitalized image of the Gazzetta Uffiziale Degli Stati Uniti Delle Isole Jonie is avaible online: http://invenio.lib.auth.gr/record/29681/files/arc-2005-7589.pdf [consulted on February 8th 2011]. 11 . For a brief historical review of the Ionian Islands and their status as a British Protectorate see Panayiotis S. Kapetanakis, “The Ionian State in the ‘British’ Nineteenth Century, 1814-1864: From Adriatic Isolation to Atlantic Integration”, International Journal of Maritime History, n° 1, June 2010, p. 163-184. 12 . For the nationality of the vessels sailing to and from the Ionian Islands’ ports, apart from the Odysseus, Ionian Maritime History Database, see indicatively: United States, House of Representatives, 37th Congress, 3rd Session, Ex. Doc. No. 63, Letter of the Secretary of State, Department of State, Transmitting a Report on the Commercial Relations of the United States with Foreign Countries, for the Year Ended September 30, 1862, Washington-DC, 1863. 13 . 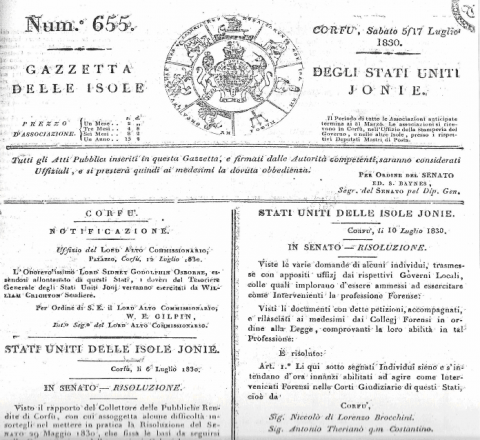 Atti Emanati del Terzo Parlamento degli Stati Uniti delle Isole Jonie Sotto la Costituzione del 1817, durante la Sua Terza Sessione Tenuta nell’ Anno 1831, Atto No. 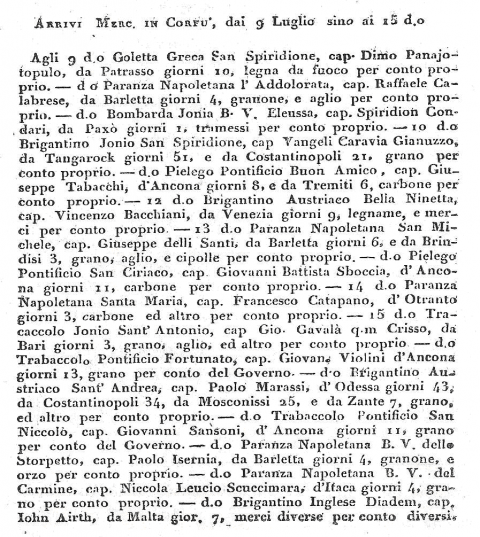 44, Stampati con Autorizzazione del Governo Generale, Nella Stamperia del Governo, Corfu, 1831, p. 30-41. 14 . 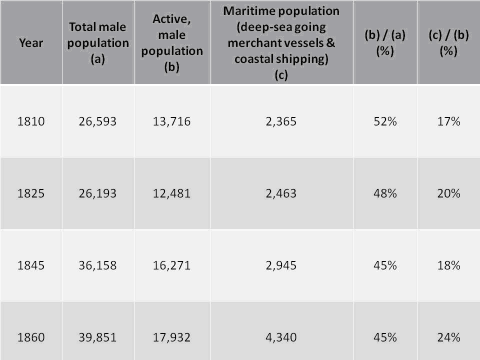 For more information of the Odysseus, Ionian Maritime History Database, see Panayiotis S. Kapetanakis, “The deep-sea going merchant fleet of the Seven Islands…”, op. cit., p. 15-27. 15 . For a brief presentation of the importance of using electronic databases in order to study or re-study maritime economic history, see Panayiotis S. Kapetanakis, “Gauging Maritime Trade between the Mediterranean and Northern Europe in the Late Eighteenth and mid-Nineteenth Centuries, using Electronic Databases”, Journal of Mediterranean Studies, n° 2, 2010, p. 295-310. 16 . In the absence of the formal Ionian Register of Shipping (which I have not found yet in the Greek or British archives), I used the lists of arrivals and departures of the Ionian merchant vessels, by removing the duplicates (e.g. same ship entering twice or more in a given year has been counted as one ship), in order to estimate the numerical data on the capacity (number and type of vessels) of the Ionian fleet. 17 . For the gradual specialization of the Ionian merchant fleet in transporting grain cargoes from the granaries of the Black Sea towards the Mediterranean ports, see Panayiotis S. Kapetanakis, “The Ionian Danube, 1815-64: Terms and conditions of the Ionian maritime presence in the Danube River, and how the latter has affected the Ionian shipping business’ structures”, in Gelina Harlaftis and Radu G. Păun (dir. ), Greeks in 19th Century Romania (Proceedings of the International Conference, Bucharest, 2009, October 2-4), Athens, Alpha Bank Historical Archives, (forthcoming). Panayiotis S. Kapetanakis, “The Ionian State…”, art. cit., p. 163-184. 18 . For the maritime centre of Cephalonia during the period of the British protection (1815-1864), see Panayiotis S. Kapetanakis, “The maritime centre of Cephalonia in the era of the British protection: terms of development and supremacy”, in Proceedings of the IX International Panionion Conference (Paxos Island, 26-30 May 2010), Paxos, Eteria Paxinon Meleton, (forthcoming) (in Greek). 19 . Panayiotis S. Kapetanakis, “The Ionian Danube…”, art. cit. For the Kefallinia Insurance Company and the commercial house of Focas Alexandratos see notarial deeds of Gerasimos and Athanasios Solomos (1810-1830, 1849-1859): Solomos Archive, General State Archives, Archive of the Prefecture of Cephalonia. See also Stanley Chapman, Merchant Enterprise in Britain. From the Industrial Revolution to World War I, Cambridge, Cambridge University Press, 2003, p. 57. 20 . Christopher A Bayly, “The First Age of Global Imperialism, c. 1760-1830”, Journal of Imperial and Commonwealth History, n° 26, May 1998, p. 28-47; John Dunn Gardner, The Ionian Islands in relation to Greece, with suggestions for advancing our trade with the Turkish countries of the Adriatic, and the Danube, London, James Ridgway, 1859, p. 64-65; Bipan Chandra, Essays on Colonialism, New Delhi, Orient Longman Limited, 1999, p. 1-20; see also J. H. Parry, Philip Sherlock, and Anthony Maingot, A Short History of the West Indies, Oxford, Macmillan-Caribbean, 1956, ch. XIV. 22 . On Malta, see Carmel Vassallo, “The Maltese Merchant Fleet and the Black Sea Grain Trade in the Nineteenth Century”, International Journal of Maritime History, n° 13, December 2001, p. 19-36. 23 . Panayiotis S. Kapetanakis, “The Ionian Danube…”, art. cit. See also Panayiotis S. Kapetanakis, “From Amphitrite to Odysseus: sailing with the Ionian Shipping in the eastern Mediterranean waters during the revolutionary decade of 1820’s”, in Gelina Harlaftis and Katerina Papakonstantinou (dir. ), The Rise of the Shipping of the Greeks in the Mediterranean Trade in the 18th century, Athens, (forthcoming) (in Greek). Panayiotis Kapetanakis, « Shipping and Trade in a British semi-colony : the Case of the United States of the Ionian Islands (1815-1864) », Cahiers de la Méditerranée, 85 | 2012, 269-284. Panayiotis Kapetanakis est né à Athènes. Il a obtenu un diplôme en histoire de l’université d’Athènes en 1999, a complété une maîtrise en histoire grecque moderne en 2005 et soutenu un doctorat en histoire maritime à l’Université Ionienne à Corfou en 2010. Il s’intéresse à l’histoire maritime du xixe et du xxe siècle, au colonialisme, à l’impérialisme britannique et à la diaspora grecque. Depuis 2010 il est chercheur associé à l’Institut de recherches néohelléniques, de la Fondation nationale hellénique de recherche (NHRF) (http://www.eie.gr/nhrf/institutes/inr/structure/section_b1-fr.html). Il a participé à des conférences internationales, publié des articles dans des revues scientifiques (International Journal of Maritime History, juin 2010 ; et Journal of Mediterranean Studies, n° 2, 2010) et a contribué aux ouvrages édités par Gelina Harlaftis.